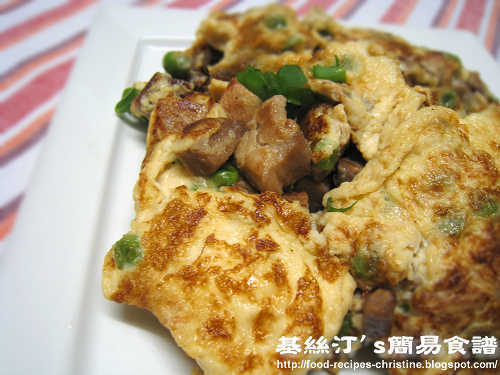 Here comes another delicious dish in Chinese home cooking. When I wrote this recipe in Chinese, there’s horrible news breaking out on China’s toxic milk. Most of my friends in Hong Kong didn’t dare to take the risk of consuming any milk at all. A little trick used in the recipe was to whisk eggs with some milk. So, when I posted the recipe, I put a remark that the milk called for in the recipe could be replaced by water. The main ingredient of the fried eggs was the BBQ pork that I baked the other day, that means I used the leftover to make this quick and yummy dish. Shred BBQ pork or cut them into small cubes. Lightly beat eggs with milk. Sprinkle with salt and pepper to taste. Set aside. Blanch green peas in boiling water for 3 minutes and drain well. Heat 2 tablespoons of cooking oil and fry shredded BBQ pork over medium heat for a little while. Don’t fry them too long as they are cooked. The pork would be too dry otherwise. 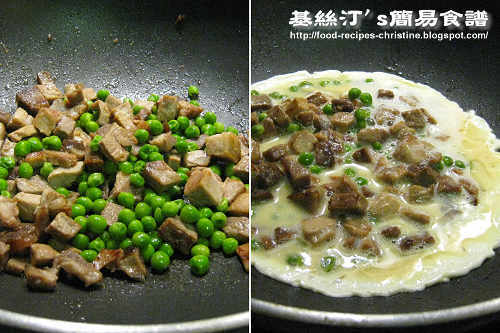 Add green peas and pour in egg mixture. Let the egg mixture sit and cook for a while until the base is cooked. Turn the other side and fry until done. Dish up. As BBQ pork would have been coated with honey already, it would be easily burn if they fry too long or over high heat. You might like to use non-stick frying pan to get better results. Both BBQ and green peas are my son's favourite. Will give it a try soon. Tks for your sharing. How old is he? I know not many kids like eating green peas. Your son is wonderful. We have same taste then! My son is 3.5yrs old now. He is a big fan of beans & peas. Chickpeas, edamames, snow peas, red beans, black beans... an endless list. Hehehe! Give my hi5 to your son. He's so wonderful. Happy New Year and wish you all the best!